"From the day you buy your new RV or motorhome, things are going to start breaking, that's why you need an RV Extended Warranty"
From the day you buy your new RV or motorhome, things are going to start breaking. It's a fact of RVing life. And sometimes those necessary repairs can be very expensive. Of course, if you have bought a quality motorhome from a reputable manufacturer, chances are that your factory warranty will take care of whatever problems you have for the duration of the warranty period. But what happens after the factory warranty expires? Well, unless you have an extended warranty contract that insures against major repair bills, you are pretty much on your own. If you have plenty of money saved up for just such emergencies, then you may be just fine, but if you have to budget your monthly expenses an extended warranty service contract may be a viable consideration. The main advantage to any extended warranty contract is that you can in effect place a cap on the amount of repair costs that you have associated with whatever you are insuring. So if the warranty costs you $1,000 and it runs for 3 years, you should not have more than $1,000 in major repair bills during that time if all goes as it should. Extended warranties usually do not cover normal wear and tear items, so you still will have to budget for that, but it's main purpose is to insure against large unexpected repair bills. Be sure that you know exactly what is covered under the warranty and for how long. It is a very good practice to read these contracts through completely and become thoroughly familiar with them to avoid surprises later on. Ask fellow experienced RVers about recommendations regarding extended service contracts, and be careful to listen for how each was treated when a claim arose. If you hear several complaints about a certain company, it is wise to avoid them altogether no matter how good their rates may seem. Establish where you can take your RV for repairs when it breaks down. Some companies have very limited arrangements for service or require you to be in a certain geographical area for repair service, and if you break down outside that area, it could be a real problem. The best companies have plenty of RV repair facilities for you to choose from that cover almost anywhere you wish to travel. 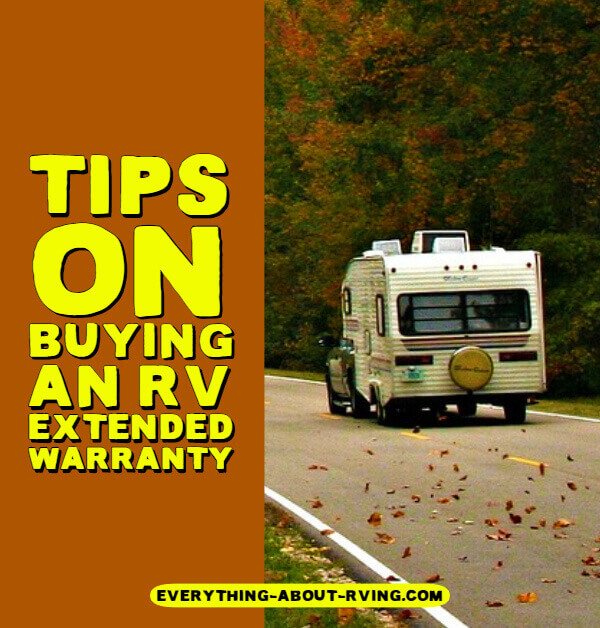 *How long has this RV extended warranty company been in business? If it is a relative newcomer, let them establish a reputation at sometimes else's expense, not yours. Admittedly, all of this homework and research can be a little time-consuming to do, but it can also save you lots of money and grief in the long run, and help add to your peace of mind as you travel.